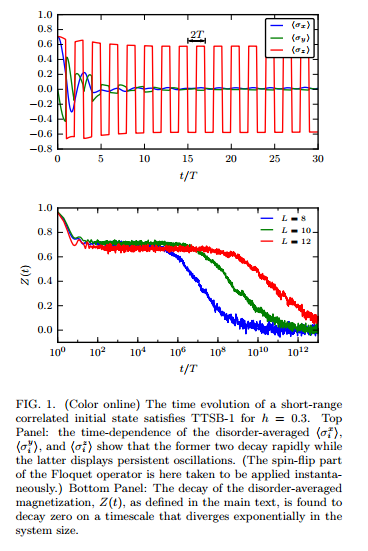 Researchers have defined what it means for time translation symmetry to be spontaneously broken in a quantum system, and show with analytical arguments and numerical simulations that this occurs in a large class of many-body-localized driven systems with discrete time-translation symmetry. In 2012 Nobel laureate Frank Wilczek first proposed the idea of time crystals. He argued that these hypothetical objects can exhibit periodic motion, such as moving in a circular orbit, in their state of lowest energy, or their “ground state.” Theoretically, objects in their ground states don’t have enough energy to move at all. Physicists from the University of California, Santa Barbara (UCSB) and Microsoft Station Q (a Microsoft research lab located on the UCSB campus) have demonstrated that it may be possible for time crystals to physically exist. The physicists have focused on the implication of time crystals that seems most surprising, which is that time crystals are predicted to spontaneously break a fundamental symmetry called “time-translation symmetry.” To understand what this means, the researchers explain what spontaneous symmetry breaking is. If time crystals really do spontaneously break time-translation symmetry, then the laws of nature that govern time crystals wouldn’t change with time, but the time crystals themselves would change over time due to their ground-state motion, spontaneously breaking the symmetry. We must look beyond strict thermal equilibrium. This should not be too surprising, as the state ρ preserves all the symmetries of H, which would suggest that no symmetry can be spontaneously broken. For symmetries other than time translation, the resolution to this paradox is well-known: in a system with a spontaneously broken symmetry, there is ergodicity-breaking and the lifetime of a symmetry-breaking state diverges as the system size grows. Thus, in the thermodynamic limit, the state ρ is unphysical and is never reached. Signatures of MBL have been observed in trapped systems of neutral atoms and trapped ions, and signatures of single-particle localization have been seen in coupled superconducting qubits. In any of these systems, one can prepare an arbitrary initial product state, evolve to late times according to a drive in the class considered here, and measure the “spins” in the desired basis. Their prediction is that persistent oscillations will be observed at a fraction of the drive frequency. “In collaboration with experimental research groups, we are exploring the possibility of realizing Floquet time crystals in systems of cold atomic gases,” said coauthor Chetan Nayak at Microsoft Station Q and UCSB.